2017 January CEO Report: CEO Exits Surge to 128 | Challenger, Gray & Christmas, Inc. The January total was 2 percent lower than the same month a year ago, when 131 CEOs announced their departures. Last January marked a 24-month high for CEO departures; in January 2014, the same number of CEOs left their posts. January departures were led by financial firms and hospitals which each saw 18 departures. Government and non-profit institutions followed with 15. Another 12 CEOs left their posts from health care products companies, while 10 executives left the top posts at computer firms. “January is a good time to announce new leadership for many companies. Organizations have had the opportunity to assess performance from the previous year and enact new strategies,” said John Challenger, chief executive officer of global outplacement firm Challenger, Gray & Christmas, Inc. In fact, companies announce the most CEO changes in January on average than any other month of the year, according to Challenger data. Since 2010, an average of 115 CEOs announce their departures in January. 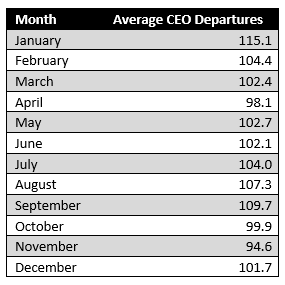 The next closest month is September, when an average of 109 CEOs leave their posts. “Meanwhile, organizations who have a prepared succession strategy or leaders with long tenures and want to retire feel the beginning of the year is an appropriate time to step aside,” noted Challenger. Thirty-nine CEOs stepped down into a board or other C-level position within the company in January, the most for the month. Another 31 retired from their posts, while 24 resigned. Twenty CEOs found new positions in other companies, eight as CEOs in those organizations. California leads all states in CEO departures with 14, while Texas recorded 11 chief executive exits. Massachusetts companies announced 8 CEO changes. Tennessee, Florida, New York, and Pennsylvania each recorded seven CEO exits.